Today was one of those total no-win days. For the most part at least. Adrian was up often during the night and early too. Got out the door later than I wanted. Made fun plans with Andrew before a photosession. But of course due to time constraints those didn't work out. So of course I told him when I got back we could go to the park. So Plan B: Dairy Queen! Should be fun, right? And it was. Until time to depart. Said kiddo had a meltdown about not getting to put a hundred coins in the cool Make a Wish coin thing. Oh just a couple was not enough. Cue whining. And complaining. We might as well have not even gone. What do you do with the complaining? Does it get to you as much as it gets to me? I worked at a daycare for 3 1/2 years and have done nannying on and off ever since. 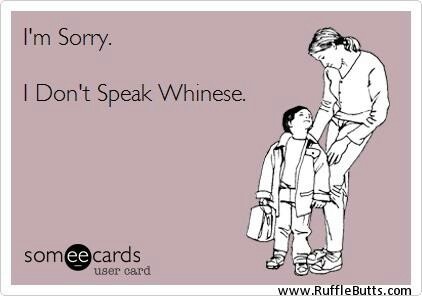 Whining is like my biggest pet peeve. I usually tell the offender that, "Oh, I'm sorry. I can't hear you when you whine." And most of the time it works. But not tonight. It would be funny if it were more like the adults in Charlie Brown but oh of course not. It's like a symphony. Done by 3-year-olds. Way out of tune. With very high notes. And very loud notes. Super fun. But I think the thing that gets me more? Ingratitude I told our sweet boy that he needed to decide to have a happy heart or we weren't going to be able to do special treats like this. And that he needed to stop complaining." Cue dramatic, "Ohhhh!! Nooo!! Then I will just NEVER EVER be able to get a treat. FOREVERRRR!! And then I will be really. SUPER. Sad. I will have big tears! FOREVER!! You will just make me cry!" Insert dramatic fake cry. Ah some days. You just can't win. But there's always tomorrow, right?? !